reporting process and by the final report, showing environmental and social commitment and performance. Firstly, the organization will have the advantage of a learning process involving the core reporting team. They will get to know the company much better, will see the real challenges and will tend to commit to solving problems and to celebrating positive aspects of the organization’s performance. Other employees, in different areas, will also be involved in the reporting process, even if only for data gathering rather than in the process coordination. They will discuss the task with others and by doing so, many more people in the organization (especially in a large organization) will find out about the process that is taking place. If the process is transparent, it can help strengthen the company’s reputation. 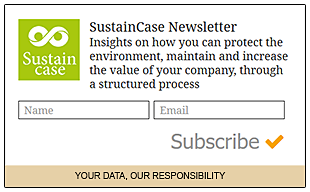 The reporting process demonstrates that a company is not just “talking” about sustainability issues, but also preparing to publicly discuss, measure and act on these issues. This will strengthen the company’s internal and external reputation. Finally, the workforce will contribute more and stay longer if motivated, empowered and aligned with strategic objectives. The final report is occasionally also used in the selection process for potential employees and for attracting specially talented candidates. Organizations have to distinguish themselves from the competition through their values, work climate, principles followed, and performance reported. 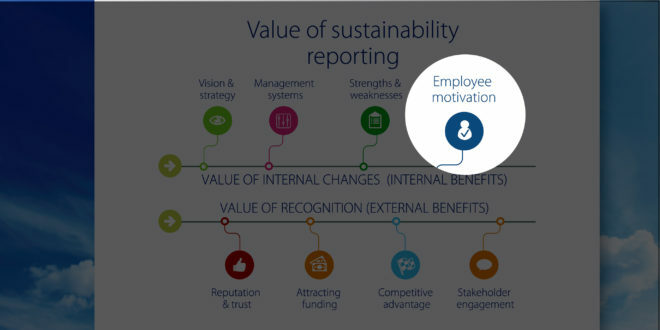 A sustainability report communicates commitment and can attract motivated employees. Tweet This!